Adin's extensive antique, vintage & estate diamond jewelry collection includes exclusive wedding bands and engagement rings. A diamond is a precious stone that is pure native crystallized carbon, highly valued, especially when free from flaws and cut into various forms with differently shaped facets of variable numbers and positions, and consequently showing great brilliance and prismatic colours. It is the hardest substance known, being rated 10 on the Mohs' Scale (although hardness varies with the direction in the crystal and with the geographic source of the stone); hence it can be cut or faceted only with another diamond or diamond powder. Nevertheless, diamonds are brittle. The stone is readily subject to cleavage, as was known to Indian lapidaries and rediscovered by W. H. Wollaston. It has a very high refractive index and strong colour dispersion. It is sometimes colourless or nearly so; but some diamonds have various colours in pastel shades. Many diamonds fluoresce under ultraviolet rays in a range of colours. Clear and flawless diamonds are of the "first water". The largest known faceted diamond is the Cullinan Diamond (530.20 carats); the smallest weighs 0.0008 carats and has 58 facets. As for large rough diamonds, a list made in 1970 shows 24 of over 500 carats and 24 between 400 and 500 carats. The value of a diamond depends on its size (increasing rapidly when over 4 carats, but less so for very large stones), and also on the colour, freedom from flaws, and quality of the cutting. The principal source was originally India and then Brazil (from 1728), but now it is South Africa and other countries in Africa, as well as Siberia and Venezuela. The largest producer of gem quality diamonds is De Beers Consolidated Mines, Ltd (founded in 1888 by Cecil Rhodes), which exercises control of the western world's supply and distribution, thus maintaining control of prices. Synthetic diamonds have been produced in very minute crystals for industrial purposes, and since 1970 some of gemstone size. Certain other synthetic gemstones imitate the diamond, e.g. the white synthetic rutile, white synthetic spinel, and white synthetic sapphire. Paste and strass have also been made into stones as cheap substitutes for a diamond. 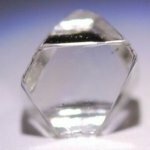 Rock crystal (quartz) has been given local misnomers as a diamond, e.g. Alaska diamond, Bristol diamond, Buxton diamond, Cornish diamond, etc. zircon altered by heat treatment simulates a diamond. All of these imitations are distinguishable by their degrees of hardness and brilliance and by their refractive indices. Another deception is the diamond doublet with a diamond slice cemented as a crown on another colourless stone. Certain types of diamonds are used exclusively for industrial purposes, e.g. the ballas, carbonado (also called 'black diamond' or 'carbon diamond'), and bo(a)art; these are used in drilling and cutting tools and as abrasives. In our catalogue you can find some exquisite examples of Antique and Vintage (Estate) diamond jewelry. Have a look and find our beautiful engagement rings, eternity rings, wedding bands and many more.